In this paper, we introduce a way to measure abnormal news volume on publicly traded companies and show how to identify important events that strongly impact stock prices. We show how our measure of abnormal media attention helps select stocks that are likely to experience strong price movements, resulting in an improvement of average “per trade” returns. We demonstrate that our measure of abnormal media attention (i.e. Event Buzz) assists in the selection of stocks that are likely to experience strong price movements, resulting in an improvement of average per-trade returns. Companies with high Event Buzz are characterized by considerably higher volatilities than companies with low Event Buzz. When focusing on companies with extreme sentiment and high Event Buzz, greater average per-trade returns were achievable - with improvements of up to 2x for both large/mid-cap and small-cap companies. By using Event Buzz, significant improvements in portfolio annualized returns are obtained from 9.6% to 15.5% and from 25.2% to 45.5% for large/mid-cap and small-cap companies, respectively. Information Ratios increase from 1.74 to 2.04, across large/mid-cap companies; whilst for small-cap companies, the IR improves from 2.73 to 3.68. Creating alpha as a portfolio manager requires extensive knowledge about one’s portfolio of companies. This holds true for both quantitative and fundamental investors. However, given the continuous pressure on costs, the days are long gone where one could simply hire an army of analysts to help you stay informed about new trends or market moving events. Today, as information flows have become more fragmented, investors have to move beyond their Bloomberg terminals to get an edge. Market moving events can be found across potentially thousands of news sources, in press-releases, and on various social media platforms. Keeping track of all this unstructured content is a daunting, if not an unrealistic task, for any human. Hence why the industry is on the hunt for big data tools to help optimize the information available and make the process more cost efficient. Investors in particular, are seeking systematic ways to sift through the vast amount of information, to easily identify the relevant trends or events that have an impact on their portfolio. This is something that is now possible thanks to the proliferation of natural language processing and the availability of various text mining solutions. Identifying which news events are important is challenging; however, in previous research [1, 2], we have established how event classification and sentiment provide valuable input to address this issue. We expand this finding in the current study, by introducing the concept of Event Buzz—which helps identify companies experiencing news spikes. We hypothesize that more important events will get more media coverage–resulting in greater price impact. So, we exploit this information by building more targeted portfolios that can be utilized by both quantitative and discretionary investors. For our research, we focus on the following: (1) the relationship between Event Buzz and return volatility, (2) the interaction between sentiment and different Event Buzz quintiles and its impact on performance, and (3) whether these more targeted portfolios provide any statistically significant value beyond a set of resampled benchmark portfolios that only focus on sentiment. Note that the sentiment and Event Buzz indicators can both be easily constructed using RavenPack’s Self-Service Platform, see Appendix D for more details. This paper is organized as follows: Section 2 describes the data used in our study and introduces two indicators from RavenPack’s Self Service Platform: Event Buzz and Entity Sentiment Indicator (ESI). Section 3 describes our predictive framework, how we build strategies, and how we can take advantage of resampled benchmark portfolios when evaluating our signals. 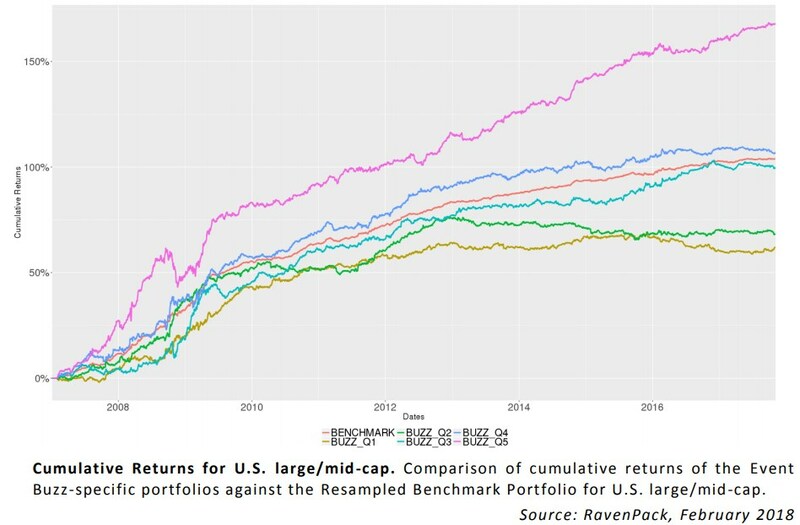 Similar to previous research , strategy performance is evaluated in specific returns as a convenient shortcut to a factor-neutral portfolio implementation using the Barra US Total Market Equity Trading Model (USFAST). In Section 4, we provide a discussion of our results, while Section 5 presents our general conclusions. To create our sentiment and Event Buzz indicators, we take advantage of RavenPack’s Self Service Platform that allows for easy filtering and aggregation across RavenPack’s analytical suite. With access to this out-of-the-box functionality, we can easily create useful features or signals that can be embedded in a quantitative or discretionary investment process.